Step 2: Learn Where You Are Now is a real eye-opener. 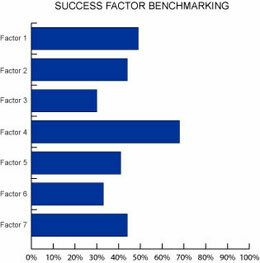 Success Factor Benchmarking comes next. You’ll learn which Success Factors you already have in place. You’ll also see, in easy to understand detail, exactly what needs to be improved. Most people are pleasantly surprised. We tend to be very aware of problems but often overlook our accomplishments. The Success Factor Benchmarking will show you what you’re doing right! A quick and confidential employee survey coupled with a management questionnaire allows for a “snapshot” of your company. Your Success Factor Benchmarking report will give you an objective view of where you are today. You’ll see how you stack up on each Success Factor. Then, you’ll dig deeper and learn where you stand on each component making up the Success Factors. Each of the components is then broken down into detailed criteria so you’ll learn exactly what you need to do… in detail. Benchmarking takes all the guesswork out of what to do. You’ll understand your current strengths and identify exactly what needs attention. © 2004-2012 Gemini Effect, LLC. All rights reserved.